Saint John Fire Department Gala! 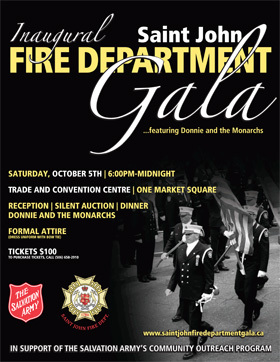 Wow, after 227 years of existence, the Saint John Fire Department is hosting its inaugural Fire Department Gala. The program for the Gala reads like a celebration of the Fire Service, but the underlying purpose of the event is to raise funds in support of The Salvation Army’s Community Outreach Program. Christmas - This past year The Salvation Army assisted over 500 families with groceries and gifts for children. Hope Café - Open weekdays providing food and a social backdrop to about 60 people a day. Emergency Assistance – Annually, over 6,000 individuals are helped with food, personal items, prescriptions, furniture, hydro, rent, etc. 50+ Club – A weekly program that includes outings & activities followed by a meal. Free Tax Preparation - Available year-round to low income families/individuals. Chapel – A weekly user-friendly church service followed by a meal. Holiday Camp - A week of camping adventure in Nova Scotia geared towards children who normally would not have the camp adventure opportunity. Advocacy - Mediation between clients and landlords, hydro providers, Social Workers etc. to speak for those unable to articulate for themselves. Referrals - With a focus on networking with community partners, The Salvation Army is able to make intelligent referrals to specific peoples within organizations. It is anticipated that ticket sales will cover the cost to run the Gala, but will only generate a modest level of support for The Salvation Army’s Community Outreach Program. This is where your sponsorship support will make a difference. This document contains the general details of our sponsorship program. Please help us help our community. For more information on benefits of sponsorship or how to become a sponsor, please download our Sponsorship Package.